Emily Eden was the daughter of William Eden, 1st Baron Auckland, and the sister of Frances "Fanny" Eden and George Eden, 1st Earl of Auckland. 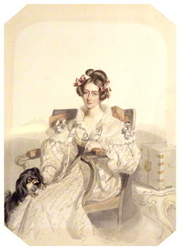 She never married, and along with her sister accompanied their brother to India during his term as Governor-General in 1835–1842. She wrote popular works about India, and her travel accounts and published letters give colorful insights into the daily life of the British Raj in India prior to the Mutiny of 1857. She was also a successful novelist as the author of two witty and satirical works, The Semi-Attached House (1859) and The Semi-Attached Couple (1860). She moved in the highest circles of London society and entertained the celebrities of the day. The 2003 novel One Last Look by Susanna Moore was inspired in part by the journals and private papers of Emily Eden and Fanny Eden. Emily Eden is currently considered a "single author." If one or more works are by a distinct, homonymous authors, go ahead and split the author. Emily Eden is composed of 7 names. You can examine and separate out names.